What is a game changer? A game changer is an event, idea, or procedure that effects a significant shift in the current manner of doing or thinking about something. 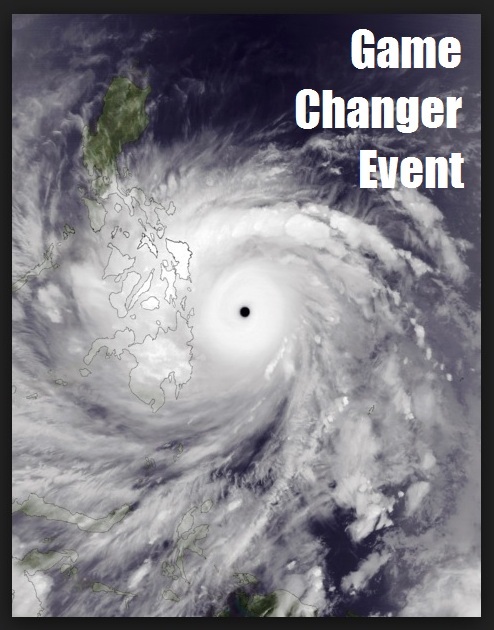 In the field of environmental science, Typhoon Yolanda (international name: Haiyan) could be called a game changer event. And why should Typhoon Yolanda be a game changer event? Well, this particular tropical storm is said to be a direct effect of global warming… and global warming is the main engine of climate change. Typhoon Haiyan, as scientific studies revealed, is the direct result of global warming and subsequently climate change. Climate change deniers, for whatever selfish intention and interest, still regard Typhoon Haiyan as a “normal” occurrence. Over 6,000 people dead and 11 million people left homeless is hardly a “normal” occurrence to me. A continued belief that climate change is a myth could only mean “business as usual” for big oil and fossil fuel interest. What then is the symbolism and use of Typhoon Haiyan as a game changer event?